Inevitable Instructors are nothing if not connected....online and also F2F in regional such as FETC and national conferences like ISTE. 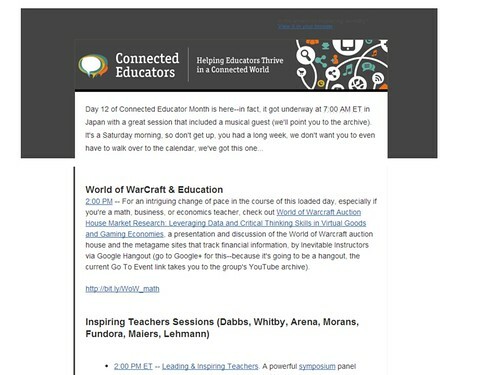 Inevitable Instructors have offered professional development for Connected Educator month in 2013, 2104 and 2015. Overview of ISTE Games & Sims Network events to include special guest Laura Briggs, President of ISTE Mobile Network, to talk about mobile games, Minecraft & apps. ISTE Games and Simulations Network held their second Minecraft and More event. We're continuing with the Virtual Goods and Gaming Economies Questline, the topic is Market Research: Leveraging Data and Critical Thinking Skills. We'll be looking at the metagame and the sites that track the Auction House in World of Warcraft. Margin Call! Another look at the World of Warcraft Auction House for business, accounting and economics classes. October 26th Minecraft Open House. This was a collaborative event with the Games MOOC, SIGVE, and the rgMOOC. Games MOOC Tweetchat using the #gamemooc hashtag.